Fuelled by ingenuity, creativity, and an understanding of a customer’s most essential needs is Kimberly Clark. Kimberly Clark are a trusted portfolio of brands including Andrex, Kleenex, Fiesta, Huggies and many more and they are almost certainly leaders of the world in essentials for a better life. So why not use this fantastic opportunity to too stock up on your customers’ needs with these incredible savings available from 2nd – 8th July 2018! Featuring a “Must Stock” range of brand leading products at profitable prices and plenty of Buy One Get One Free deals to stock up on. Plus be in with a chance to BUY & WIN! Buy 1 Case of Andrex Washlets Moist Toilet Tissue to be entered to WIN a Giant Andrex Puppy! Plus Buy One Case & You Get One FREE! Did you know facts about Kimberly Clark…? So why wait visit us at your local depot to find out more! High profit-on-return to be made with products your customers will instantly sweep up from Republic Technologies UK between 25th June & 1st July 2018. Offer your customers premium quality products from Republic Technologies UK that are used on a regular basis including normal and menthol filters in all sizes, refillable lighters, lighter gas, and matches and most importantly rolling paper. With OCB’s leading unbleached, ultra-thin papers, you not only make a POR of 44.5% but also get a case of Saka water 24x500ml absolutely FREE! If you are aiming for POR’s of 70%+, stock up on the Swan refillable lighters or Poppell’s electronic options. There is no easier way of getting the profits to roll in than with this remarkable supplier week featuring essential items that customers will buy frequently. Whether it's a celebration, gathering or simply enjoying summer downtime, grab top-sellers from Carlsberg to keep your customers happy and refreshed. 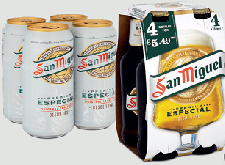 Don’t miss out on the price-marked 4 pack from San Miguel, which is said to be the world’s number one lager in impulse. This means your customers may be picking these up in bundles. There are huge POR’s to be made of 30% and above with these great brews being the customers' go-to drinks. So stock up for the fun and upcoming games too!